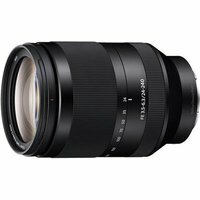 The Sony FE 24mm-240mm 10x zoom range allows this lens to cover an extensive variety of shooting situations, making it ideal for travel where reducing luggage is a priority. This all-in-one zoom allows you to switch between wide angle and telephoto without having to change lenses, so youll never miss a moment. Handheld telephoto shots and low-light photography are facilitated by built-in Optical SteadyShot (OSS) image stabilisation, and the design is dust and moisture resistant for reliable operation in challenging conditions.